This spotlight features Caitlin Cunningham’s overview of the project she worked on to build a storymap of photos by Chris Hadfield. The project was officially launched yesterday (Thursday, April 11 at 3 p.m. AT) at the Killam Library, Dalhousie University. More details are available in a Dalhousie news article, and Caitlin’s work was also featured by CTV News earlier this week. Space is one of those things that just fascinates most human beings. I mean, how many kids say they want to be an astronaut when they grow up? But very few people actually get the chance to experience space for themselves, so any opportunity to feel like we’re up there tends to be exciting. 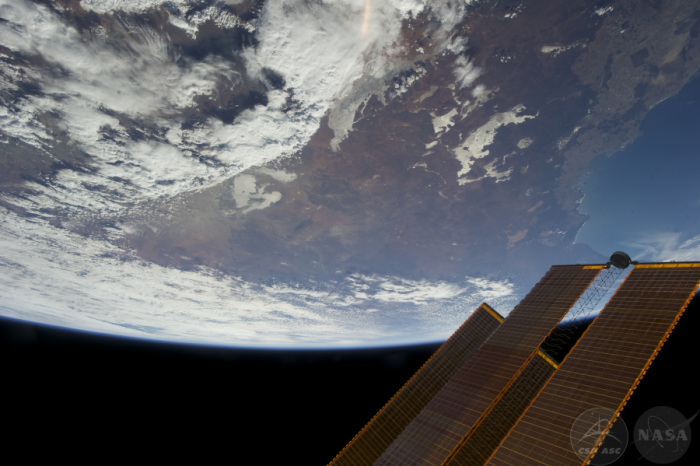 Imagine being given a drive with 13,199 photos taken while on board the International Space Station and being asked to create something that will allow the public to view the photos. This was my experience last January while working at Dalhousie University’s GIS Centre. My first thought was awesome, coolest data set ever. My second thought was how on earth am I going to go through that and what would sharing it with the public look like? The answer to the first problem ending up being manually. I went through each photo individually and pulled a subset of images that would be interesting to share, ones that were not too blurry (the space station is moving at 27,600 km/h so this was not surprisingly a common problem), looked interesting and showed a variety of places on the planet. Five months later and 13,199 photos had been reduced to 822. Now it was time to think about the second problem – how to share the photos with the world. Enter Esri Story Maps. Story Maps are a great tool to use the power of maps along with multimedia content to tell a story to the world. For this project, I ended up combining four major story maps into one to tell the story of Chris Hadfield’s mission to the International Space Station and showcase some of the photographs he took while on board. The first one is relatively simple, a map of the world with a bunch of points that each correspond to a picture of that place in the world taken from the space station. While making this map was fairly straightforward, identifying the location of the photos was not. Photos were given to me in folders labelled with a rough idea of where in the world they were, such as Prairie to Newfoundland or Australia South Coast, though some were labeled a bit more broadly, such as Africa or simply Earth. The date stamp on each photo was also useful in narrowing down the location as it could be entered into the ISS Tracker, a record of where the space station has been in its orbit since it was launched in 1998. Once the location of the photo was narrowed down a bit, I used context clues in the photos (lakes, cities, airports etc.) and Google Earth to figure out the exact location. Since this was a time consuming process, I decided to enlist the help of the public through a guessing game. For this part, I used the power of Esri’s Crowdsource Polling App. Originally created to allow users to submit comments on plans and proposals in the urban planning realm, I utilized it to allow users to view photos along with a hint as to where it may be (from the ISS tracker data) and submit their guesses as to where in the world it is. During the process of identifying photo locations, one thing that struck me was how much the world has changed since 2013 when the photos were taken. To capture the dynamic nature of the planet, I decided to create some swipe maps comparing some of Hadfield’s photos to other images of the same place from the open photo catalogues of NASA and the ESA. For the final piece of the project I decided to use some of the videos Hadfield shot in space to get a sense of what life on the space station is like. For this part, I used the Map Tour Story Map template to create a tour of the ISS. Map tours usually involve a map of some place here on Earth, but it was surprisingly easy to create a ‘map’ of the space station – it’s just a (falsely) geo-referenced image of the space station I drew in Inkscape. Using Google Street View for the ISS (yes, they’ve really done it), I was able to figure out where on the space station the video was shot and combined with NASA’s blueprints of the space station created the final map for the tour. Building this story map was an opportunity to work with one of the coolest data sets I’ve ever seen, and although it was a long, often challenging fifteen months, I am incredibly happy to be finally sharing the finished problem with the rest of the world. Hope you are just as fascinated with the photos as I was!